Today’s Hours now displaying on LIS websites! 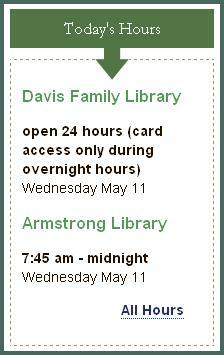 Users can now see today’s hours from the LIS web pages. The “All Hours” link takes users to the full Google Calendar, which has a pull-down menu for the various service points. More locations will be added in the coming days. Special thanks to the LIS Website Team, Carrie, and Ian for making this happen! This entry was posted in LIS Staff Interest and tagged Facebook, hours, hours of service, library hours, Library Spotlight, lis website, User Services on May 11, 2011 by Dan Frostman. Great job with the new format for the hours. I love the new Calendar view.